An area rug is just an area rug unless it is made of vinyl. Vintage Vinyl Floorcloths are hot in 2017; designers are showcasing them in their showrooms and their own homes. They come in multiple styles and sizes, made from non-slip vinyl, lay flat, and can be used indoors and outdoors. These versatile and colorful floor-cloths lend an authentic, vintage touch to any décor. Don’t look for these beauties to disappear anytime soon, they are destined to become a classic in good design. No one wants to throw money at something that isn’t going to last long or maintain its functionality or beauty. Vinyl floor cloths will last for years and look vintage but they are made from new anti-slip, lie-flat vinyl for extra durability and longevity. Use them indoors or outdoors because these easy-to-clean marvels are as versatile as they are durable! Add that little something extra with interesting colors, sizes, and patterns, it truly is an area rug that will make your friends ask for your designer’s name. With over 250 patterns and 13 sizes, there are almost limitless design possibilities when choosing vinyl floor cloth. These interesting design pieces started popping up in design showrooms in early 2017 and have quickly gained popularity as a unique floor covering. Vinyl floorcloths are a perfect solution from those who are hesitant about using traditional area rugs in kitchens and bathrooms. 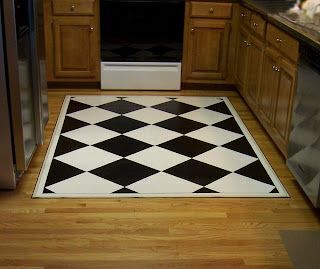 A black diamond checkered pattern would be smashing in a farmhouse kitchen, adding to the charm with a softly worn look. These floor-cloths play well on hard surfaces; don’t use them over carpets or other plush rugs. And if you use them in the dining room or under an office chair, place protective felt on the bottoms of the chairs to avoid scratches on your vinyl rugs. They really shine in high-traffic areas, where the wear and tear of daily use will add to the charm of the vintage look. If you are looking for an alternative to traditional rugs because you want something unique or you are allergic, vinyl has you (and your floor) covered. A Japonica print in tones of coral and earthy greens brings the romance of tropical breezes to your bedroom. Bring some 1940’s glamour into your entry with a black and white quatrefoil print. Add a touch of whimsy to your teen’s room with a floral pattern in soft tones of aqua and faded lime on a creamy background. From countryside style to contemporary, a little vintage style that strengthens any space. Head out to your nearest design showroom or scour the web, you’ll see that vinyl floorcloths are the way to freshen up your space in 2017. They aren’t just a trend. They are a versatile, unique, and fun way to spice up your home. Remember to see your floor as your fifth wall. Don’t be afraid to put something bold under your feet!